Why would a Finnish band release their debut album on a Portuguese label? You can't find two European countries lying further apart. After I was done pondering that geographical mystery, I started listening to Haunting Remains, a neo-classical power metal album by the three-piece founded by Burning Point vocalist Pete Ahonen. You don't remember Burning Point? I didn't either at first until I found out that we have a review of their second album released on Limb Music on this very same page. This should tell you already enough: Ghost Machinery play nice power metal that is never hurting, but rather little is sticking in your long-term memory. The only thing that somehow disturbs me throughout the album (apart from the pidgin English label info) are the omnipresent keyboards that never set any accents but rather float like a soothing carpet underneath the music. A second lead guitar instead would have added a lot of power. Pete's vocals are typically melodic metal good, if you are into the higher registers, while his guitar work is more virtuosic that you could expect from a metal three-piece. The rhythm section is solid and always best when they play the fast songs. So what about highlights? The ballad Dreamworld is icky cheese, but the rest of the material manages to keep overboard, although it's always a bad sign when the most memorable moment is a cover version, in this case the anti-war song Out In The Fields, originally by Gary Moore and the late Phil Lynott, here with added vocals from Sentenced's Ville Laihiala (I hope I spelled that right, I am not that good at not-Indo-European languages). 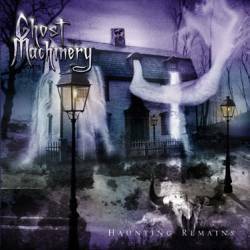 What hauntingly remains is a solid yet not too original melodic power metal album, which will have a really hard time surviving in the momentary flood of likewise releases, although if you like your melodic metal at the same time fast and technical, you might want to give this album a try.